"The popularity of Pokémon has drastically increased due to the addicting mobile game, Pokémon GO. 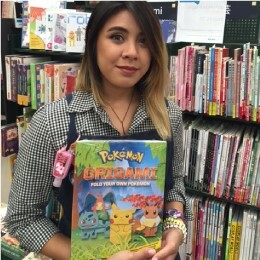 If you like Pokémon, origami, and a challenge, this is the book for you! My recommendation is the Pokémon Origami: Fold Your Own Pokémon. There are 10 Pokémon that you can make. If you happen to be in the Chicagoland area, we have an origami workshop held every fourth Sunday. Christine Joy is part of our Chicago team and has been with us for about a year. Christine works in the how-to book section. Look for her when you need assistance with practical guides! She also assists the team for the Chicago store's monthly origami workshop. In her spare time, she likes to cook and read manga. She is on Level 16 on Pokémon GO!